All our Potted Plants, Plug Packs and Plug Trays are here. Hundreds of varieties available, shipped safely to your door anywhere in Canada and the United States! Look for our Wholesale for Everyone pricing on potted herbs – from as low as $2.10 per pot when you order 3 more of a kind. 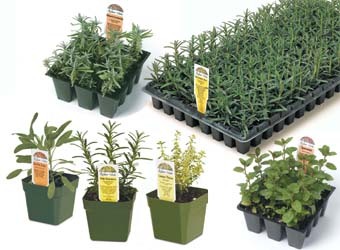 Or try our plug packs and plug trays, priced as low as 61 cents a plant. There are 12 plugs per pack and 90 plugs per tray. Please note: Potted plants are shipped April to November, weather permitting. Plug packs are shipped April and May or until they sell out in June. Plug trays are shipped March to November, weather permitting. Most plug trays are planted to order, so allow at least 8 weeks for delivery. If there other varieties you would like to see in plugs, let us know. Plants are not shipped outside North America.